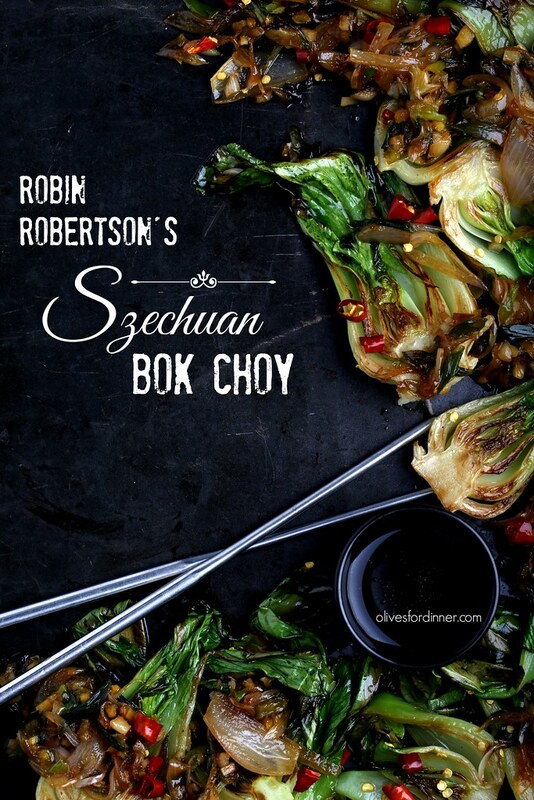 Over the past two decades, Robin Robertson has written more than 20 cookbooks. Each one is packed with tons of easy-to-follow, foolproof and approachable recipes, so it’s no wonder that each book she releases is a huge hit with her loyal and ever-growing fan base. Based on her volume alone, she’s like the Stephen King of vegan cookbooks. Her latest release, Vegan Without Borders, is her most personal collection to date, and represents her voluminous experience and expertise with global cuisine from working in restaurants, travelling, gathering insights from friends and colleagues for the past 25 years and writing the “Global Vegan” column for VegNews magazine for the past decade. What Robin calls a “pastiche of plant-based delights from all over the world,” VWB is a gorgeous hardcover cookbook packed with tons of easy-to-make recipes that celebrate cuisines from more than 20 countries across Europe, Africa, India, Asia and the Americas. Dishes like Papri Chaat from India, Black-Eyed Pea Fritters (Akara) from western Africa, Pissaladière from France, Za’atar Roasted Cauliflower from the Middle East and Pho Chay from Vietnam all have simple instructions, and about half of the recipes are accompanied by gorgeous, full-color photos. Since I tend to gravitate towards making East Asian and Southeast Asian dishes (they almost never have dairy, and meat and fish is always easy to sub out), I decided to make Robin’s Szechuan Bok Choy from VWB first. This easy-to-make recipe has about 10 ingredients and can be made in under 20 minutes. The sauce oozes into the nooks and crannies of the bok choy, and presents a perfect balance of sweet, spicy and salty flavors. The kind folks over at Andrews McMeel Publishing have not only allowed me to share Robin’s recipe here, but are also offering a giveaway of the book through this post! The winner of this giveaway is Christine … congrats and thanks to all who entered! To enter for a chance to win a copy of Robin’s Vegan Without Borders, simply leave in the comments section below your favorite type of global cuisine, including your email or some way to contact you in case you are the winner. I’ll randomly choose a winner on December 7. This giveaway is open worldwide … good luck! From Vegan Without Borders: Easy Everyday Meals from Around the World by Robin Robertson, Andrews McMeel Publishing LLC. This easy but flavorful stir-fry is typical of the cuisine of the Szechuan province of China. Made with bok choy, it’s a delicious side dish but you could add strips of tofu or seitan and serve it over rice to make it a satisfying meal. This stir-fry is also delicious made with broccoli, green beans, or asparagus. Heat the grapeseed oil in a wok or large skillet over medium-high heat. 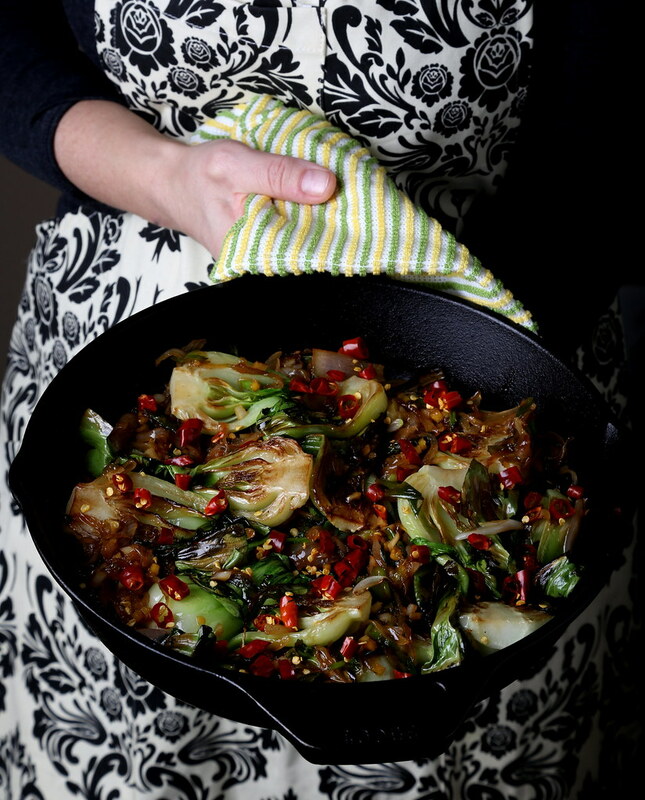 Add the bok choy and shallots and stir-fry for 2 to 3 minutes, or until almost tender. Add the garlic, ginger, and scallions and stir-fry until fragrant, about 30 seconds. Add the soy sauce, sesame oil, mirin, red pepper flakes, and sugar and stir-fry until the bok choy is tender and nicely coated with the sauce, 1 to 2 minutes. Love the dish and photos, so pretty! It's just too difficult to choose one type of global cuisine…but I guess it would be indian cuisine for me 😀 I couldn't get through winter without some delicious curries, pakoras and garlic naan. So excited to try these recipes and expand my flavor platte. I like most types of cuisine but Indian is closest to the top! I like most cuisines but Thai is my favourite. Thai green & red curries, Pad Thai, Tom Kha Gai – spicy coconut soup. Yum yum yum…. Amazing Photo!!! Impossible to pick one favorite cuisine; easier to pick one I don't like, LOL!! Wow! I didn't know this cookbook was coming out, but now it's on my radar. Thai is my favorite type of food. I love the spicy coconut-infused flavors of Thai cuisine. Thanks for hosting this giveaway. Just picked up some bok choy, can't wait to try this. Mmmmm, I love many different kinds of world cuisine – maybe Latin American food best? Yep, I used dried thai chilis in place of red pepper flakes here — I have a huge bag in my pantry that I picked up in Chinatown ages ago. It's difficult, but if I had to select just one favourite cuisine, I'd have to say Italian. Japanese and Indian are very close runners-up, though! I'm a fan of all kinds of ethnic food but I'd probably say that my favorite is Indian..
My favorite kind is Japanese, but I really like all kinds of food! I'm a vegetarian raised in India so of course Indian cuisine,mostly because it has lots of option for vegetarians.My second favorite is Japanese. It is so hard to choose, but hard pressed I'd have to say India, and after that Italian, but I dwell into all kinds. Indian food is probably my favorite. Ethiopian meals are so beautiful and intricately spiced. I also enjoy Thai cuisine. If I'm cooking, Japanese is my favorite. If I'm going out, I love Thai. I'm Russian and while my native cuisine is difficult to veganize, my mushroom stroganoff has been my biggest success yet. My vote goes for the challenge of Russian cuisine. They are all so wonderful. But Vietnamese wins for us. Italian and Mexican are my favorites, but I'm trying to branch out and have recently been trying more European recipes. I would *love* to get my hands on this book and expand my cooking horizons even more! I'd have to say Italian and Thai are my faves. I am not sure if my previous comment went through, that's why I am commenting again. My apologies for duplicate, if both go through. My favorite global cuisine is Vietnamese. Me too I cook a lot of Since East Asian and Southeast Asian dishes. It's so good and also pretty cheap to make – specially when you do your groceries at the Asian market! Thanks again love your cookbooks! I love Italian food a lot. Pastas, salads, desserts… everything Italian. I'm looking to keep my plant based diet interesting, and can't wait to get this book! My cookbook wishlist is getting dangerously long! I absolutely love Indian food, but Italian is probably my favorite, since it's the food I was brought up on. My favorite global cuisine? It depends so much on the season and my mood where I'm in.. But generally I think Italian and Mexican cuisine are the ones I'm inspired most by. But I also love Moroccan, Indian and Thai cuisine. Cuisine from the Indian subcontinent is my go-to and favorite. Plus anything that can be made into a soup. Definitely Burmese. It incorporates Chinese, Thai and Indian and includes to much regional diversity. I always love Italian food! How can you go wrong with tomato sauce?!!? Indian is delicious, too! i just love Indian food and Asian. Me too i cook a lot of Since East Asian and Southeast Asian dishes! It's so good and also pretty cheap to make, specially when you make your groceries at the asian market. So hard to choose, but I would say Indian and Thai are tied for my all time faves! Mmm. Thai…Vietnamese…Japanese. Nothing says comfort like a giant bowl of miso. My favourite is Chinese food since it's what I grew up with. Cantonese food to be specific. But other than that, I could hardly pick. Thai, Japanese, Vietnamese, Ethiopian…they all have fantastic foods! I love the variety of spicy dishes found in Indian cuisine. It is hard for me to pick just one, I love Greek, Mexican, Asian and Italian. Love your blog! And can't wait to try the bok choy recipe. You've got me thinking. I can say my favorite protein is beans, but my favorite cuisine. . . for today I'll choose Thai. (This is funny, because it's not a very beany cuisine!) Thanks. Ahhh….well my favorite was ALWAYS Italian HANDS DOWN. But it's so hard, expensive, and time consuming to recreate my italian favorites as a commuting college student (sniff, I miss you, lasagna), so I guess I'll have to change my favorite to Mexican! But I'm also loving Asian flavors. Really, the only cuisine I'm not too keen on is Indian, which is ironically the vegan staple! Itakian in my favourite, however it needs a lot of veganizing, I not always have an idea how to do it.